Each year, the Hilton Village Board seeks nominations for to recognize one of our outstanding individuals who has unselfishly served the Hilton/Parma community. This selection is made by secret ballot and the decision is based on volunteerism, community involvement and all around good spirit. 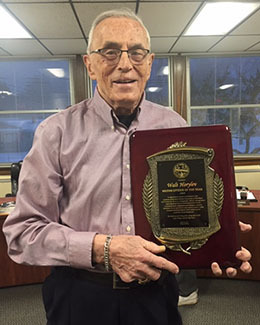 On Tuesday March 5th, 2019 at the Village of Hilton Board of Trustee’s meeting, Mayor Joe Lee presented Walt Horylev with the 2019 Citizen of the Year award. In appreciation and recognition of your commitment to the Hilton Parma Community as Vice Mayor and Trustee for 22 years, acting as the “official” photographer capturing many historical and memorable events, to forming many committees and helping to organize festivities. We are grateful for your work to make a viable economic business district while enhancing the aesthetics of our downtown. Walt, we thank you for being such a large part of the Little Village with the Big Heart. The Village of Hilton Board of Trustee’s is now accepting suggestions for our 2019 Citizen of the Year. 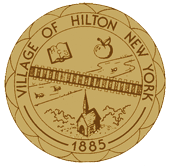 Submittals can be dropped off or emailed to the Village of Hilton, 59 Henry St., Hilton, NY 14468.